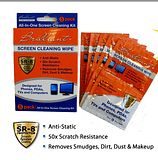 Brilliant screen cleaning wipes with SR-8 provides gentle, superior cleaning to any electronic screen and removes dust, dirt, finger prints and makeup while imparting an invisible, durable barrier that protects screens 50x more form scratching. Helps protect against re-soiling to keep your screen brilliantly clean! I tried it and it works!!! I clean, (don't you just despise that word) my computer and TV screens at least every other day, if not daily. And I couldn't believe what had been left behind after using the Brilliant Screen Cleaning Wipes!! *﻿Brilliant screen cleaning wipe with SR-8 provides gentle, superior cleaning to electronic screens and removes dust, dirt, finger prints and makeup while imparting an invisible, durable barrier that protects screens 50 times more from scratching. Helps protect against re-soiling to keep your screen brilliantly clean! *Cleans and protects monitors, electronics, eyeware and more! *Brilliant Screen Cleaning WipesTM with SR-8TM provides gentle superior cleaning while imparting an invisible durable barrier that resists scratches, soiling and water spots. *SR-8 is a Polimer Additive that reduces surface tension making cleaning easier each time it is used. I am so excited about this product and wanted to share it with all of you!!! Are you like me when it comes to your eye glasses? Glasses on, glasses off, smudge, clean, glasses on and the cycle continues. I have to wear glasses for reading and while on computer so I wear them a major part of the day. And found myself cleaning them many times during the day........until now!!! I volunteered to try this new product, Brilliant Lenses Cleaner, and it worked!! 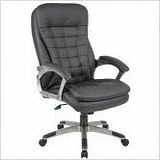 Just spray, wipe with the microfiber cloth, put on and see clearly for hours. Brilliant Lenses Cleaner and optical microfiber cloth. A premium eyeglass cleaner with SR-8 that adds a protective barrier to lenses to resist scratches and soiling from water, sweat, dust and dirt. For ALL types of lenses. It comes with the following: 2 tubes of glass cleaner, a microfiber cloth and a carrying case so that you can take it on the go. I now have a new morning routine. Grab my mug of coffee, find my glasses, spray front, spray back, wipe dry and start reading, blogging and more reading. I am now set for the day!!! I definitely recommend this product for those who use any type of eye glasses. I was approached by Pete at Executive Gift Shoppe to do a review of one of his products, which are many. It took me a very long time just to decide which item to choose. Just some of the items they offer are personalized business card holders, personalized flasks for those fall hayrides, clocks, desk organizers, golf gifts and so much more!!! Before I show you what I chose, I thought these items were kind of unique. On the left, one of the business card holders that I liked and on the left, those aren't cell phones, but are flasks. I am so excited about this giveaway!!! Especially if you are like me!!!! Do you run to the store at the last minute because you remembered you needed to send a greeting card? A Get Well card, Birthday card, Thinking Of You card? You get the idea. Wouldn't it be great to have these cards at your fingertips? Then this is the giveaway for you!!!!! UPrinting.com also offers custom greeting cards and commercial printing. UPrinting.com has generously offered to give one of my followers and/or visitors a chance to win 50....that's right......50!!!! assorted greeting cards. No more running to the store at the last minute. If you are a follower of my blog, you know that I have trouble with anything to do with technology. But, hold on, you are not going to believe this!! I was sent a Digital Photo Key Chain from WholesaleKeyChain.com to try out. And I DID IT!! I was able to get all the features to work!!! Now I have my photo albums on my key chain. How great is that? The best part is that it is so easy to use. And the exciting news is that WholesaleKeyChain.com has generously offered to have one of my followers and/or visitors have one too!!! You can have, right at your finger tips, pictures of family, pets, vacations, grandchildren, friends, etc. etc. The list is endless!! Auto / manual picture slide show, slide time adjustable. Time display including date, week, hours, minutes and seconds. Time manual adjustable or sync with computer via software. Picture size automatically cut by software. 1 x USB cable "
So get out those bulky albums and start deciding what 72 pictures you will put in your digital photo key chain when you win!! For your chance to win one, follow these instructions and Good Luck! !